The truth, it is often said, is stranger than fiction. The strange tale of Jimmy “Orion” Ellis is one of the stories that’s so bizarre it can only be real. Showbiz is a creepy place, filled with unsavory characters that basically earn a living preying on the dreams of vulnerable people. This story begins with the death of a legend: on August 16, 1977 the King of Rock ‘n Roll, Elvis Aaron Presley died in his Tennessee mansion. A record produced named Shelby Singleton bought the legendary Sun Records in 1969 from Sam Phillips. Sun Records is the recording studio/label where Elvis first hit it big. In strange move, Singleton signed Jimmy Ellis to his Sun Records. The first thing Singleton did was to release two Elvis covers that Ellis had recorded back in 1972, “That’s Alright Mama” and “Blue Moon of Kentucky.” Singleton was no fool, though, he knew that people wouldn’t really be interested in hearing some unknown singer from Mississippi re-record two Elvis songs—no matter how much he sounded like the King—so Singleton had the songs released with a question mark on the cover. Thus neither Elvis nor Ellis was credited for the songs, though it was just an unsavory marketing gimmick, the releases fueled growing speculation that Elvis was, in fact, not dead. This trick was used again on a Jerry Lee Lewis duets album, in which Ellis sang with Jerry Lee on “Save the Last Dance for Me.” Again, no credits were attributed to either Elvis or Ellis leaving many to think that the King had somehow magically come back from the dead to sing. The biggest mystery surrounding Orion? Where he got that snazzy mask. So far this is pretty incredible story, right? Can you believe I haven’t even told you the weird part yet? I often wondered why exactly people love to believe that Elvis is still alive. I’m sure that a lot of it has to do with the disbelief that such an amazing talent could really, truly be gone. When our heroes die it reminds us all of our own mortality, and some people can’t really handle that I guess. But what I find so incredible about the myth/legend surrounding Elvis’ death is that all of these tales spread and grew before the Internet. Mass media as we know it was still in its infancy, how were these tales of Elvis’ life-after-death spread? Unscrupulous businessmen like Shelby Singleton no doubt helped to stoke the fires of conspiracy enthusiasts/despondent Elvis fans, but can you believe it was a housewife from Georgia that kicked the Elvis-is-Alive phenomenon off? When the king died in 1977, Gail Brewer-Giorgio wrote a book about a Southern rock singer who decided to escape from the limelight by faking his own death. The name of the book? ORION. In the book the singer wears a mask on stage to cover his face, which is what Jimmy Ellis started to do when he performed on stage under the name Orion. Putting on the mask was no doubt so that people in the audience were left guessing whether or not Ellis was Elvis, however the strange part is that Jimmy Ellis never said he was Elvis. He also wasn’t an Elvis impersonator; the songs he sang were for the most part songs that weren’t Elis songs. Amazingly, Ellis charted 9 times on the country music charts as Orion. In 1981 Cash Box Magazine (a magazine dedicated to the coin-operated music industry) named Orion one of three most promising country music acts. By 1983, Ellis was weary of the Orion act and wanted to be taken seriously as an artist. During a live appearance he angrily took off his mask and refused to put it on again. Despite being a talented singer and having achieved moderate success in the world of country music, Orion’s career never recovered. The cat was truly out of the bag: Jimmy Ellis was Orion not Elvis Presley. Ellis left Sun Records and pretty much faded from the music biz. On December 12, 1998 Jimmy Ellis was murdered in his Alabama pawnshop during a robbery gone bad. I cannot believe someone has not made the story of Jimmy Ellis into a film because it has all the makings of a really great movie. Perhaps there have been attempts to bring Ellis’ story to the big screen but they’ve failed due to the outlandish nature of his story. I know I was skeptical when I first heard all of this. Orion’s musical career had the negative side effect of helping to keep Elvis Presley off of US postage stamps. The rule for celebrities/public figures to appear on United States postage is that they must be dead for at least 10 years—the uncertainty created by Orion and conspiracy theorists kept Elvis’ image from appearing on US postage until 1993. 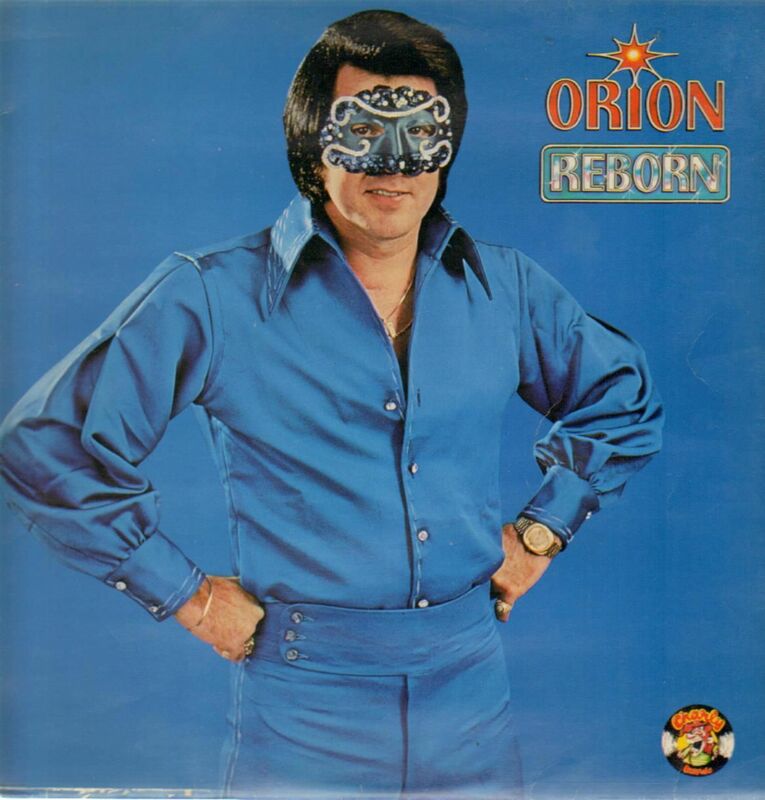 Orion’s 1979 album REBORN is available on Spotify and I’ve been listening to it trying to figure out if it’s the single greatest or worst thing. It’s one thing to be inspired by or influenced by a singer or band…but Orion is another thing entirely. Musically, I guess you could call Orion a tribute act but even that feels wrong. A lot of people have made millions of dollars off of Elvis and his tragic death; most of them are vultures, parasites of the music industry. I can’t really put Jimmy Ellis into that category though. True he was complicit in a sort-of-conspiracy that in hindsight seems really tacky, but he was also a victim. Dreams are a powerful carrot, and people will do strange and terrible things to achieve them. I can’t fault Ellis for trying to make it as a singer, by any means necessary. I think the ultimate irony would be if someone out there started performing as Orion. But that would just be crazy, right?